Counting chamber: This one is called the Neubauer improved. There are other standards with different grids available as well. The hemocytometer (or haemocytometer or counting chamber) is a specimen slide which is used to determine the concentration of cells in a liquid sample. It is frequently used to determine the concentration of blood cells (hence the name “hemo-“) but also the concentration of sperm cells in a sample. The cover glass, which is placed on the sample, does not simply float on the liquid, but is held in place at a specified height (usually 0.1mm). Additionally, a grid is etched into the glass of the hemocytometer. This grid, an arrangement of squares of different sizes, allows for an easy counting of cells. This way it is possible to determine the number of cells in a specified volume. The fluid containing the cells must be appropriately prepared before applying it to the hemocytometer. Proper mixing: The fluid should be a homogenous suspension. Cells that stick together in clumps are difficult to count and they are not evenly distributed. Appropriate concentration: The concentration of the cells should neither be too high or too low. If the concentration is too high, then the cells overlap and are difficult to count. A low concentration of only a few cells per square results in a higher statistical error and it is then necessary to count more squares (which takes time). Suspensions that have a too high concentration should be diluted 1:10, 1:100 and 1:1000. A 1:10 dilution can be made by taking 1 part of the sample and mixing it with 9 parts water (or better saline of correct concentration to prevent bursting of the cells). The dilution must later be considered when calculating the final concentration. Counting cells that are on a line: Cells that are on the line of a grid require special attention. Cells that touch the top and right lines of a square should not be counted, cells on the bottom and left side should be counted. Number of squares to count: The lower the concentration, the more squares should be counted. Otherwise one introduces statistical errors. How many squares? To find out one could calculate the cell concentration per ml based on the numbers obtained from 2 different squares. If the final result is very different, then this can be an indication of sampling error. 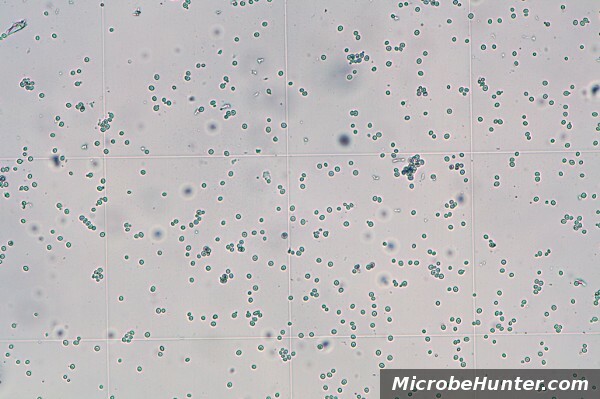 Yeast cells in the hemocytometer. 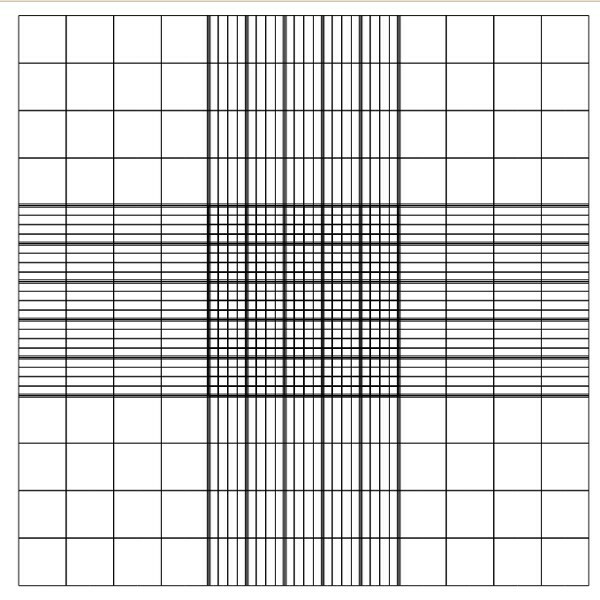 The grid is clearly visible. Yeast cell suspension applied to the chamber. Notice that some of the cell suspension has gone into the overflow area. Here it is necessary to do some simple math. The following numbers are needed: number of cells counted in a square, area of the square, height of the sample, dilution factor. The objective is to find the number of cells in 1ml of original solution. Step 1 – Averaging: If one did not count all of the cells in a large square (1mmx1mm) then it is necessary to average the results first before proceeding. For the purpose of this example, I use an average cell count of 123.456 cells. Step 2 – Computing the volume: It is necessary to determine the volume represented by the square. The width and height of the square (e.g. 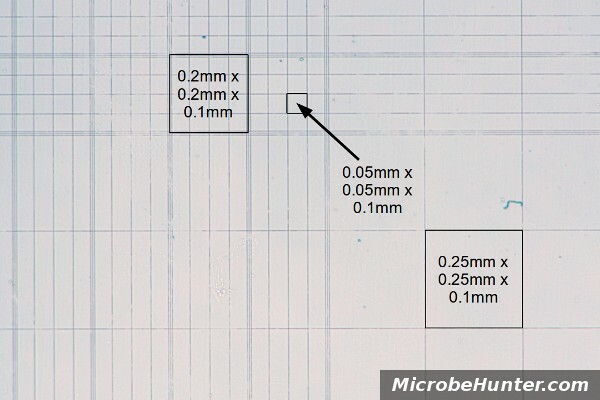 0.25mm x 0.25mm) must be multiplied by the height of the sample (often printed on the hemocytometer, in this example it is 0.1mm): v = 0.25mm x 0.25mm x 0.1mm = 0.00625mm³ = 0.00625ul (where ul is microliters). Step 4 – Correcting for dilution: If the sample was diluted before counting, then this must be taking into consideration as well. We assume that the sample was diluted 1:10. The final result is therefore 19 752 960 cells x 10 = 197 529 600 cells in 1 ml. That a lot of cells. One counting chambers has grids of different sizes. Consult the manual to find out the size. Do not count cells on the top and right lines. Here it’s necessary to count the in the big square because there are too few cells in individual small squares. Type of counting chambers: There are different types of counting chambers available, with different grid sizes. One counting chamber also has grids of different sizes. Take care that that you know the grid size and height (read the instruction manual) otherwise you’ll make calculation errors. Use the provided cover glasses: They are thicker than the standard 0.15mm cover glasses. They are therefore less flexible and the surface tension of the fluid will not deform them. This way the height of the fluid is standardized. Moving cells: Moving cells (such as sperm cells) are difficult to count. These cells must first be immobilized. Objective The hemocytometer is much thicker than a regular slide. Be careful that you do not crash the objective into the hemocytometer when focusing. Counting chamber seen from the side. Grid layout of the Neubauer Improved hemocytometer. Disclaimer: This is an educational website. The operator of this website can not be held accountable for incorrect information. Please inform us if you discover any inaccuracies and mistakes. Always follow the instructions of the manufacturer. I figured sperm counts were done something like this, but I never knew the specifics. Thanks! It may be necessary to first immobilize the sperm cells, otherwise they are too difficult to count – swimming around! thank u so much , for explaning so nicely ,m plz try to explain for large squres also. The process is similar for all squares. Count the cells in a large square and use the volume of a large square for calculating the cell density. Did you know that there are disposable plastic hemocytometers? Much, much cheaper than the glass ones. Since the top is fixed, I had hoped to be able to use the oil immersion lens to observe bacteria, but then realized that the refractive index of oil is the same as glass and not the same as plastic. A disappointment. 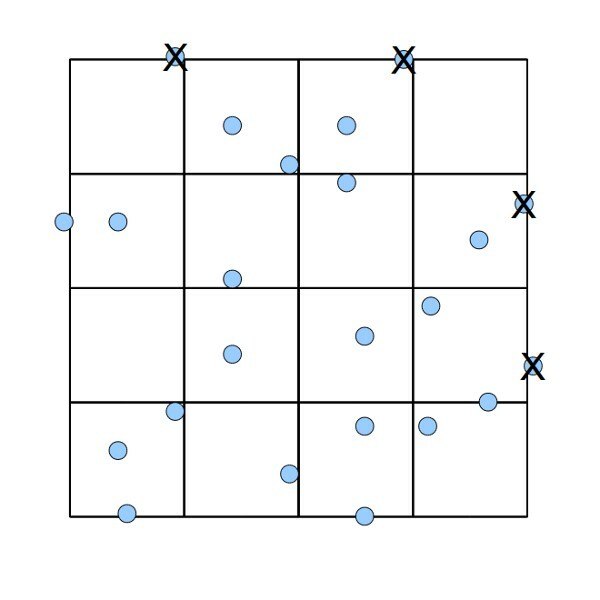 when counting the cells in the 5 small squares of the center square in both sides of the chamber correct? @Gail: bacteria are usually counted by plating them in Petri dishes, letting them grow and counting the colonies. Their number is expressed as CFU (colony forming unit). If you have to count bacteria that are not colturable in a solid medium (as spirochaetes, for instance) there is a bacteria counting slide. It is similar to the haemocitometer, but division lines are much closer and the volume is smaller. Usually it is best used with a dark field microscope, so no oil is used. @Gail here you can find some counting chambers: the most used in microbiology (as far as I know) is the Thoma patter one. The best and simplest way in my opinion is to count a few large squares and average it, than multiply it in the dilution and in 10000 with is a large square volume. How do i calculate how much cells volume i have to take if i counted 2000000 cells in the sulution and i need to load 190micL with 3000 cells in the plate (190micL in each well in a 96 wells plate) ? number of squares counted x the area (length x width) x the area. the area is 0.1; the length and width of the 9 large squares is 1 x 1.
number of squares counted x the area (length x width) x the depth. I think the explanation on this site was good. However I have heard of some different approaches regarding how to clean the slide and chamber. Some say water and some say ethanol, which is prefered? I recently found a manufacturer of glass disposable hemacytometers, so the problem with refractive index for plastic hemacytometers is non existing. They have multiple counting grids available – Neubauer improved, Burker, Fuchs-Rosenthal, etc.. even special Sperm hemacytometers. This company – CellVision (www.cellvision.nl) is ISO and all products CE marked. This was VERY helpful. Now I completely understand. But are you counting only 1 box? My professor wanted us to count a 100cells and how many boxes it took to count those 100cells. For example I counted 100cells/40boxes. I wasn’t sure what I was doing that lab although. Of course you should count many boxes and then average the number of cells per box. If you count the number of boxes needed for 100 cells, then this is also possible, but how are you going to deal with the situation of reaching 100 cells in the middle of a box? In this case you should finish counting the box (and you have more than100 cells). Ultimately it does not really matter which method you use, as long as the number of boxes and cells is sufficiently large to reduce sampling error. athe reason your prof. said that you should count 100 cells is so that you ensure that sampling error is reasonably low. So I took my practical exam today and the professor wanted me to load my hemocytometer with a UNKNOWN that she provided and then count the cells I see up to 100. And then give the CELL COUNT. And the next step was to do a serial dilution of my answer. I counted 100 cells / about 40 boxes and did the VIABLE COUNT. But I didn’t know how to show the serial dilution steps or know how I’m suppose to show/prove my answer. Can anyone explain this. And then plate a certain amount from one my dilution tubes.i just don’t understand. a. You do a total cell count with the hemocytometer. This means that both living and dead cells are counted. You can not distinguish them under the microscope. b. By plating them on agar plates, you can do a viable count. Colonies start to form only from the living cells. The viable count will be less than or equal to, to the total cell count. c. A serial dilution is possibly necessary for both types of counting. if the cell density in the unknown sample is too high, then you will not be able to see the individual cells under the microscope and the colonies on the plates are going to overlap. for this reason, you plate and count under the microscope the original sample (hoping it will be ok, but possible is not), and then do 1:10 dilutions. each dilution step is counted and plated, and the result is then multiplied by the dilution factor, to obtain the conentration of the original sample again. After all, you are interested in the total count and viable count of the original sample and not of the dilutions. the dilutions only help you to do the counting and have a practical reason. d. example. if you decide to use a 1:100 dilution for the viable count (plating) and a 1:1000 dilution for the hemocytometer counting, then you have to multiply the result of the viable counting by 100 and the hemocytometer counting by 1000. Both answers should be nearly the same, with the difference coming only from the dead cells. e. if you use a too high dilution for counting and plating, then you have sampling error. If the dilution is too low (too high concentration), then you will miss some of the cells during the counting, resulting again in errors. e. sometimes you count and plate the cells of the 1:10, 1:100 and 1:1000 dilutions and then calculate back to the original concentration (by multiplying by 10, 100, 1000, respecively) and then take an average of these values, whkch should be then the same. but more often, you simply ignore the dilutions which are too high and too low. I am still slightly confused, matter factly still very confused. How do I figure out how to do the correct serial dilution by first counting the cells on a hemocytometer ? I didnt do a dilution FIRST. I had to charge my hemo. And then figure out a serial dilution. From my cell count. I don’t know I’m over thinking and stressing. I do appreciate your helpfulness of responding back, being that this is a very old post. considering how fast one can do a serial dilution, it is rather unusual to first charge the hemocytometer. in real life, you first do a serial dilution, which takes only 3minutes to do. I guess your prof made you do it the other way around for educational purposes. ok, now if i understand correctly, you have to do a total cell count first and then calculate the dilution factor that you need for plate counting. a. you first have to know the cell density that you want to have on your plates. let’s assume it is 500 cfu (colony forming units, viable cells) per 100ul, which is 5000 cfu per ml. this cell density should not be too high, otherwise there are too many colonies to count. if too low, then sampling error. b. you then take the the original sample and do a total cell count in the hemocytometer. if the total cell count is, let’s say, 50000 cells per ml, then you know that you have to do a 1:10 dilution in order to get your 5000 cells/ml for the plates. You divide the cell count from the hemocytometer by the cell density that you want to have on the plate. Chances are pretty good that you won’t get a nice round number, and dilutions are always made by a factor of 10. assume that the calculation results in a number like 6.5. in this case you would proabably do a 1:10 dilution anyway. so I do not really see a point in doing the math to determine the dilution factor. making a 1:6.5 dilution will require you again to do determine how much sample you have to mix with water (or saline, whatever you use), and requires further calculations. Just do a normal diluton series first. Now, what I can imagine is, that by first looking at the sample in the hemo, you can get a rough estimate if a dilution series is necessary at all. if there are too many cells to count, then you do a dilution series. 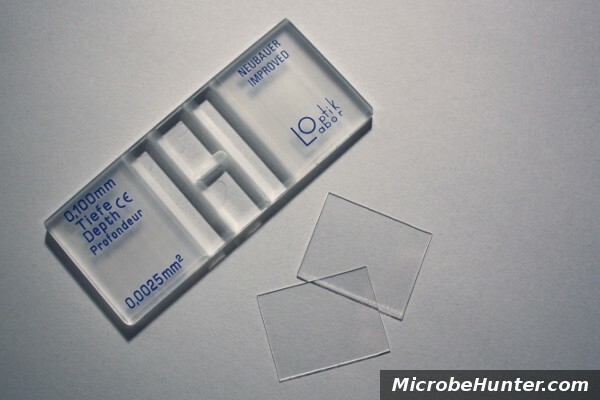 c. Disadvantages of the system are, that the hemocytometer will give you a total count, and the plate count method will give you a viable count. so you have to assmume that most cells in the sample are alive. otherwise the is no point in doing the math. second disadvantage is, that different cells form colonies of different size. so the ideal cell denisty for plate counting is different from microorganism to microorganism. cells that form large colonies need a higher dilution factor (less colonies on the plate). it is thefore best to plate the original sample and then the 1:10, 1:100 and 1:1000 dilutions and then select the suitable plates later. third disadvantage is, that the original sample might have so many cells that it is not possible to count them under the hemocytometer. so you have to do a dilution series anyway. Why do you not consider the cells that touch two of the four sides of the quadrant (for example: the right and down)? >Why do you not consider the cells that touch two of the four sides of the quadrant (for example: the right and down)? So that the same cells are not counted twice if you count adjacent quadrants. If the cells are too concentrated in the original sample, then you can not count them. Too many cells and many will overlap and cover each other. You then need to dilute the cells in water (or salt solution). You then do the counting of the cells using the diluted suspension but have to then calculate back the original cell there are in the original suspension. If theree are too many cells to count, then you need to dilute them further. if there are cousters of many cells, then you need to homgenize the cells more to separat the clusters. you want to determine total cell count and therefore need to count all the cells in a cluster. generally, hemocytometers are not used to determine bacterial count, as you will also count dead cells. agar plating is much easier to do. 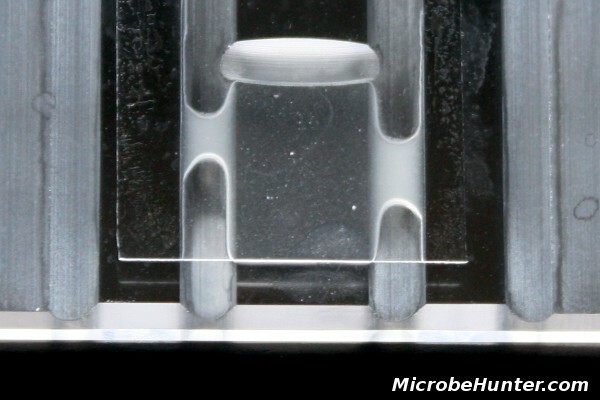 Can we count bacterial cells using Hemocytometer? >Can we count bacterial cells using Hemocytometer? Why not? You will get total cell count (live and dead bacteria). The problem is, that some bacteria form clusters and that it is not always easy to know if you are looking at a bacterium or at something else. The bacteria also move around and therefore it is better to do the counting using a photograph. Make sure that you see the whole depth of the hemocytometer (use a low magnification) otherwise you will not count all of the bacteria due to the low depth of field of the high power objective. so, yo need to determine the viable count and total count of freeze dried anaerobic bacteria. Now, this of course depends on how much of the bacteria you suspend in your sample. I guess the point of your experiment is to find out how many percent of the cells survived the freeze drying procedure, otherwise I can not imagine the point of determining the cell counts (it simply depends on how concentrated your sample is). And plating will NOT be so easy, as the anaerobic bacteria will not grow if they are in contact with air. So you have to make sure that the suspending of the bacteria and growth of them takes place in a pure nitrogen environment. If they are strict anaerobic, then they start to die, once they are in contact with air (maybe this is another reason for determining the count ratios, unless it is for purely educational purposes). First you determine the concentration of the cells of your sample. For this the total amount of liquid used to do the calculation is irrelevant. You say that you used 10 ul, but this is not important for concentration. Place it on the haemocytometer and count out the cells of several squares, average them and multiply by the depth of the haemocytometer 0.1mm. For example, if your squares are 0.1mm on each side, and you count 100 cells in average in one square, then you have 100 cells / (0.1mm x 0.1mm x 0.1 mm) = 100 cells / 0.001mm^3 = 100 000 cells / mm^3 = 100 000 000 cells / ml. If you diluted the cells eg 1/1000 before doing the count, then multiply this value by 1000. If you use high magnification, then the depth of field is very narrow. If the haemocytometer is 0.1 mm deep, but your depth of field smaller than this, which it is for 100x oil, then you will not see the bacteria outside this depth of field, because they are too blurry. Many cells will also float in and out of focus and your counting field, making it difficult, clumps of bacteria make counting difficult as well. Need to suspend well. Close your condenser as much as possible to increase contrast and depth of field, or better yet, use phase contrast. For staining, you need to heat fix the cells, but you can not do this using the hemocytometer, you are going to break it. Maybe you can find a stain, which only stains the viable cells, I do not know one, but this would also solve the growth issue of anaerobic bacteria. Please i need to be furnish with the difference between Old neubauer counting chamber and Improved neubauer counting chamber. Should anyone want to count bacteria, it is better to use a Petroff – Hausser Counting Chamber. The smallest squares are 1/400 mm (0.05 x 0.05 mm) and the coverslip to slide distance is 0.02 mm. These dimensions are significantly smaller than those of a hemocytometer, otherwise the instruments look the same. how can we classify antigen of human from this test…..? is there any method plz describe it…..
Hemocytomerters are not designed for immunological research. And the human has thousands of antigens.